Each Enpresseâ„¢ cycle of 28 tablets consists of three different drug phases as follows: Phase 1 comprised of 6 pink tablets, each containing 0.050 mg of levonorgestrel (d(-)-13 beta-ethyl-17-alpha-ethinyl-17-beta-hydroxygon-4-en-3-one), a totally synthetic progestogen, and 0.030 mg of ethinyl estradiol (19-nor-17Î±-pregna-1,3,5(10)-trien-20-yne-3,17-diol); phase 2 comprised of 5 white tablets, each containing 0.075 mg levonorgestrel and 0.040 mg ethinyl estradiol; and phase 3 comprised of 10 orange tablets, each containing 0.125 mg levonorgestrel and 0.030 mg ethinyl estradiol; then followed by 7 light-green inert tablets. The inactive ingredients present are hypromellose, lactose monohydrate, magnesium stearate, microcrystalline cellulose, polyethylene glycol, and pregelatinized starch. Coloring agents used are as follows: pink, 0.050mg/0.030mg tablets: D&C Yellow No. 10 Aluminum Lake and D&C Red No. 7 Calcium Lake; white, 0.075mg/0.040mg tablets: none; orange, 0.125mg/0.030mg tablets: FD&C Yellow No. 6 Aluminum Lake, 38-42%; and light-green, inert tablets: D&C Yellow No. 10 Aluminum Lake, FD&C Yellow No. 6 Aluminum Lake and FD&C Blue No. 1 Aluminum Lake. An increased risk of myocardial infarction has been attributed to oral contraceptive use. This risk is primarily in smokers or women with other underlying risk factors for coronary-artery disease such as hypertension, hypercholesterolemia, morbid obesity, and diabetes. The relative risk of heart attack for current oral-contraceptive users has been estimated to be two to six. The risk is very low under the age of 30. One study gathered data from a variety of sources which have estimated the mortality rate associated with different methods of contraception at different ages (Table III). These estimates include the combined risk of death associated with contraceptive methods plus the risk attributable to pregnancy in the event of method failure. Each method of contraception has its specific benefits and risks. The study concluded that with the exception of oral-contraceptive users 35 and older who smoke and 40 and older who do not smoke, mortality associated with all methods of birth control is less than that associated with childbirth. The observation of a possible increase in risk of mortality with age for oral contraceptive users is based on data gathered in the 1970'sâ€”but not reported until 1983. However, current clinical practice involves the use of lower estrogen dose formulations combined with careful restriction of oral-contraceptive use to women who do not have the various risk factors listed in this labeling. Earlier studies have reported an increased lifetime relative risk of gallbladder surgery in users of oral contraceptives and estrogens. More recent studies, however, have shown that the relative risk of developing gallbladder disease among oral-contraceptive users may be minimal. The recent findings of minimal risk may be related to the use of oral contraceptive formulations containing lower hormonal doses of estrogens and progestogens. Oral contraceptives have been shown to cause glucose intolerance in a significant percentage of users. 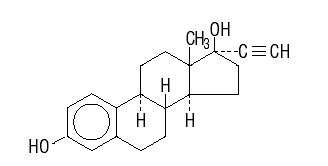 Oral contraceptives containing greater than 75 micrograms of estrogens cause hyperinsulinism, while lower doses of estrogen cause less glucose intolerance. Progestogens increase insulin secretion and create insulin resistance, this effect varying with different progestational agents. However, in the nondiabetic woman, oral contraceptives appear to have no effect on fasting blood glucose. Because of these demonstrated effects, prediabetic and diabetic women should be carefully observed while taking oral contraceptives. A small proportion of women will have persistent hypertriglyceridemia while on the pill. 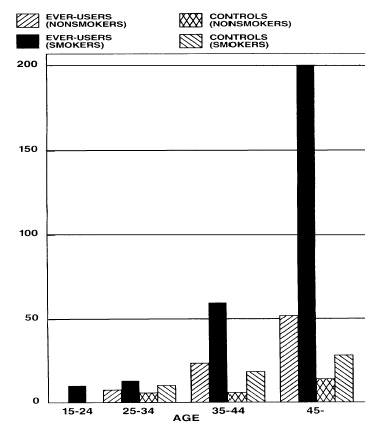 As discussed earlier (see "Warnings," 1a. and 1d. ), changes in serum triglycerides and lipoprotein levels have been reported in oral-contraceptive users. Breakthrough bleeding and spotting are sometimes encountered in patients on oral contraceptives, especially during the first three months of use. The type and dose of progestogen may be important. Nonhormonal causes should be considered and adequate diagnostic measures taken to rule out malignancy or pregnancy in the event of breakthrough bleeding, as in the case of any abnormal vaginal bleeding. If pathology has been excluded, time or a change to another formulation may solve the problem. In the event of amenorrhea, pregnancy should be ruled out. Increased prothrombin and factors Vll, VIII, IX, and X; decreased antithrombin 3; increased norepinephrine-induced platelet aggregability. 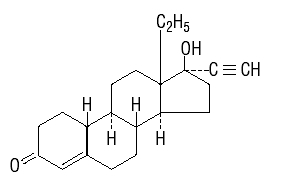 Safety and efficacy of levonorgestrel and ethinyl estradiol tablets - triphasic regimen have been established in women of reproductive age. Safety and efficacy are expected to be the same for postpubertal adolescents under the age of 16 and users 16 and older. Use of this product before menarche is not indicated. To achieve maximum contraceptive effectiveness, Enpresse-28 Tablets (levonorgestrel and ethinyl estradiol tablets, USPâ€”triphasic regimen) must be taken exactly as directed and at intervals not exceeding 24 hours. 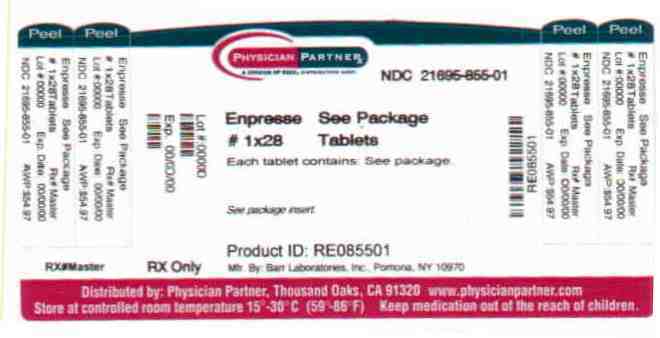 Enpresse-28 Tablets are a three-phase preparation plus 7 inert tablets. The dosage of Enpresse-28 Tablets is one tablet daily for 28 consecutive days per menstrual cycle in the following order: 6 pink tablets (phase 1), followed by 5 white tablets (phase 2), followed by 10 orange tablets (phase 3), plus 7 light-green inert tablets, according to the prescribed schedule. When switching from another oral contraceptive, Enpresse-28 Tablets should be started on the first day of bleeding following the last active tablet taken of the previous oral contraceptive. The patient begins her next and all subsequent 28-day courses of Enpresse-28 Tablets on the same day of the week that she began her first course, following the same schedule. She begins taking her pink tablets on the next day after ingestion of the last light-green tablet, regardless of whether or not a menstrual period has occurred or is still in progress. Any time a subsequent cycle of Enpresse-28 Tablets is started later than the next day, the patient should be protected by another means of contraception until she has taken a tablet daily for seven consecutive days. If spotting or breakthrough bleeding occurs, the patient is instructed to continue on the same regimen. This type of bleeding is usually transient and without significance; however, if the bleeding is persistent or prolonged, the patient is advised to consult her physician. Although the occurrence of pregnancy is highly unlikely if Enpresse-28 Tablets are taken according to directions, if withdrawal bleeding does not occur, the possibility of pregnancy must be considered. If the patient has not adhered to the prescribed schedule (missed one or more tablets or started taking them on a day later than she should have), the probability of pregnancy should be considered at the time of the first missed period and appropriate diagnostic measures taken before the medication is resumed. If the patient has adhered to the prescribed regimen and misses two consecutive periods, pregnancy should be ruled out before continuing the contraceptive regimen. The risk of pregnancy increases with each active (pink, white, or orange) tablet missed. For additional patient instructions regarding missed pills, see the "WHAT TO DO IF YOU MISS PILLS" section in the DETAILED PATIENT LABELING below. If breakthrough bleeding occurs following missed tablets, it will usually be transient and of no consequence. If the patient misses one or more light-green tablets, she is still protected against pregnancy provided she begins taking pink tablets again on the proper day. In the nonlactating mother, Enpresse-28 may be initiated postpartum, for contraception. When the tablets are administered in the postpartum period, the increased risk of thromboembolic disease associated with the postpartum period must be considered (see "CONTRAINDICATIONS," "WARNINGS," and "PRECAUTIONS" concerning thromboembolic disease). It is to be noted that early resumption of ovulation may occur if Parlodel® (bromocriptine mesylate) has been used for the prevention of lactation. Enpresseâ„¢ 28 Tablets (levonorgestrel and ethinyl estradiol tablets, USP â€“ triphasic regimen), NDC 21695-855-01, are available in packages of six cyclic dispensers. Each cycle contains 28 round tablets as follows: six pink, coated tablets marked "dp" and "510", each containing 0.050 mg levonorgestrel and 0.030 mg ethinyl estradiol; five white, coated tablets marked "dp" and "511", each containing 0.075 mg levonorgestrel and 0.040 mg ethinyl estradiol; ten orange, coated tablets marked "dp" and "512", each containing 0.125 mg levonorgestrel and 0.030 mg ethinyl estradiol and seven light-green inert tablets marked "dp" and "519". Oral contraceptives or "birth-control pills" or "the pill" are used to prevent pregnancy and are more effective than other nonsurgical methods of birth control. When they are taken correctly, the chance of becoming pregnant is less than 1.0% when used perfectly, without missing any pills. Typical failure rates are less than 3.0% per year. The chance of becoming pregnant increases with each missed pill during the menstrual cycle. Cigarette smoking increases the risk of serious adverse effects on the heart and blood vessels from oral- contraceptive use. This risk increases with age and with heavy smoking (15 or more cigarettes per day) and is quite marked in women over 35 years of age. Women who use oral contraceptives should not smoke. The 28-pill pack has 21 "active" pink, white or orange pills (with hormones) to take for 3 weeks, followed by 1 week of "reminder" light-green pills (without hormones). 2. 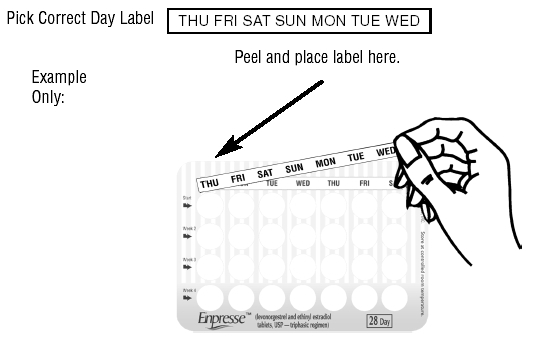 Place this day label strip on the cycle tablet dispenser over the area that has the days of the week (starting with Sunday) printed on the blister card. 3. Take the first "active" [pink-colored] pill of the first pack during the first 24 hours of your period. 1. Take the first "active" pink pill of the first pack on the Sunday after your period starts, even if you are still bleeding. If your period begins on Sunday, start the pack that same day.